The fastest game on two feet is one of the many titles players and fans give lacrosse. It is an exhilarating sport, full of passion, determination, and physical fitness. The training and conditioning it takes to play lacrosse 100% guarantees that you will be in the greatest shape of your life, have a lot of endurance, and absolutely love the way you feel. Lacrosse combines the running and set up of soccer, as well as giving you the raw, physical playing style that you get in hockey. This includes full body checks, stick checks and poke checks. Lacrosse gives you the conditioning that both soccer and hockey give you. Field lacrosse is set up similar to a soccer field, with a goalie, 3 defense, 3 Midfielders, and 3 offense. Anyone who enjoys sports will fall in love with lacrosse, like so many others who have discovered the sport. There are over 150,000 people who play lacrosse at a competitive level! And that's not considering all of the fans who play with their families, or children just learning the sport! Lacrosse is spreading and growing faster than any other sport. Since 1999, participation has increased by over 500%! It is spreading all over the world like wild fire! The United States, Canada, United Kingdom, Australia, and many other European countries now have world teams with more joining every year. Men's lacrosse gear consists of a helmet, gloves, elbow pads, chest pads, mouth guard, and most importantly, a stick. There are several main brands for all types of gear, including Brine, STX, and Warrior. There are many other large brands like Debeer, Gait, Reebok, Adidas, Champion Sports, Nike and more new ones added all the time. Women's lacrosse is a bit different then men's. Woman's lacrosse has a different setup of mens Lacrosse, including a goalie, 6 defense, and 5 offense. Also most physical contact is illegal. Stick checks are legal in lacrosse as long as they are not too rough. The gear needed for girls lacrosse consists of sticks and goggles. Many prefer to wear gloves as well. Lacrosse is an all around amazing sport, with players who love and respect each other, themselves, and of course the game! It is a competitive sport, a leisure sport, a family sport, and most importantly, it is a fun and athletic sport, that will last you a lifetime. Lax Sticks can help you on your way! 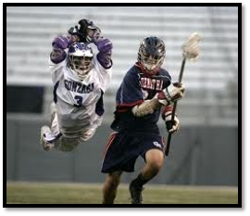 The attackman's responsibility is to score goals and help his teammates score goals by passing the ball. The attackman generally restricts his play to the offensive end of the field. A good attackman demonstrates excellent stick work with both hands and has quick feet to maneuver around the goal. Each team has three attackmen on the field during play. The midfielder's responsibility is to cover the entire field, playing both offense and defense. The midfielder is a key to the transition game, and is often called upon to clear the ball from defense to offense. A good midfielder demonstrates good stick work including throwing, catching and scooping. Speed and stamina are essential. Each team has three midfielders on the field. The defenseman's responsibility is to defend the goal. The defenseman generally restricts his play to the defensive end of the field. A good defenseman should be able to react quickly in game situations. Agility and aggressiveness are necessary, but great stick work is more essential to attack. Each team has three defensemen on the field.